I had the great pleasure of Skyping with Kit Galloway this week, a stream-of-consciousness conversation that covered everything from the early histories of global satellite spectacles; to the radical social communications events Kit and Sherrie Rabinowitz staged with the Electronic Café; to the dire times we now face in the age of TRUMP. This was in advance of Kit’s interview coming up on April 24 as part of our new series, Networked Conversations, a project of the Third Space Network. What struck me about the extraordinary history of the Electronic Café, as well as Kit and Sherrie’s seminal tele-communications Happening, Hole in Space (1980), is his essential optimism and belief in the power of technology to energize human networks. From the 1980s through the 1990s, the Electronic Café was a beehive of artistic activity, including tele-collaborations and performances connecting artists from all over the world. 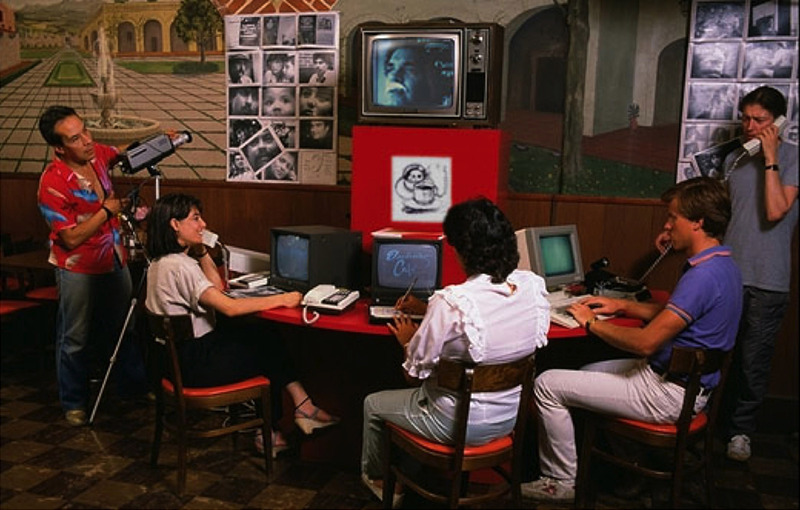 It was the prototypical cybercafe, it was the first networked alternative art space (like today’s Rhizome or Furtherfield), which began in 1984 as a project commissioned by the Los Angeles Olympic Arts Festival and LA MOCA. Along with the festival’s more conventional displays of objects and performances across the city was an unusual commission. The art collaborative Mobile Image — founded by artists Kit Galloway and Sherrie Rabinowitz — constructed their own “telecollaborative network,” composed of interconnected locations in five distinct Los Angeles communities: the Gumbo House (South Central); Ana Maria Restaurant (East LA); the 8th Street Restaurant (Koreatown); Gunter’s Cafe (Venice Beach); and the Museum Of Contemporary Art (Downtown). Despite the near ubiquitous network of social media we have at our disposal today – itself a vast constellation of connections between family, friends, colleagues, and even unknowns – the Electronic Café demonstrated very early on, that networks could initiate transformative conduits for agency, action, intervention, and dialogue: erasing boundaries and borders between people. In the age of TRUMP, as borders become hardened and social media is weaponized by TRUMP along with a renegade army of fake news alt-right activists, yes, the “real fake news,” social media also functions as a mode of positive resistance against an emerging and looming dark (post) reality. Despite the fact we find ourselves in a vast, socially mediated ocean of desperate pleas, rants, manifestos, disturbing images, and horrific news headlines, we can, with reassurance, look back at the Electronic Café as a model of how networks also convey optimism, camaraderie, shared problem solving, hope, and the erosion of division. The only way we are going to survive this alt-tidal wave that is breaking over America and the world, is through forging relationships via the network in an activated third space of shared relations, and then consecrating those connections through real action in the physical (first) space. We saw this phenomenon clearly on January 21st in Washington, DC and around the world. Six million people participated in the Women’s March, activated through the network, a strategy of resistance that finds its roots, in large part, at the Electronic Café. We can build on Kit Galloway and Sherrie Rabinowitz’ vision of optimism and belief in powerful human networks cultivated and formed through communications technologies. There is no doubt, the revolution will be networked.